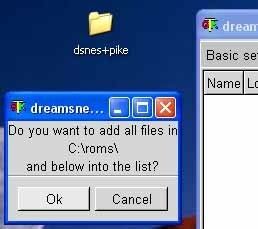 This tutorial tries to explain how to create a CD-R containing the DreamSNES SNES emulator for Dreamcast. No prior knowledge of the Dreamcast or CD-burning is required, but general knowledge on GUI-conventions like "right-clicking something" and "open a directory by clicking on it" is assumed. Spanish translation made by PoGoNa. Observe: An incompatibility with older Windows versions exists in the installer script. If you use Windows 98 or Windows ME you need to download a temporary workaround until I get time to write a better installer. Download 98installer-patch.zip (2KiB) and read the instructions enclused in the archive. Note: The pictures for this tutorial is taken from a Windows XP session, so the image borders might look different from what you are used to on your Win98, NT or other installation. 1.5. If you are using Windows 98 or Windows ME you need to download 98installer-patch.zip (2KiB) and read the enclosed instructions. Uncompress it and open the resulting "dsnes+pike" folder. Right-click "gtkpike-setup" and choose in "Install". This will start the installation of Pike (the language the installer is written in). Have patience, it can take a few minutes. Up to ten or fifteen minutes if you have a slow computer or slow disks. 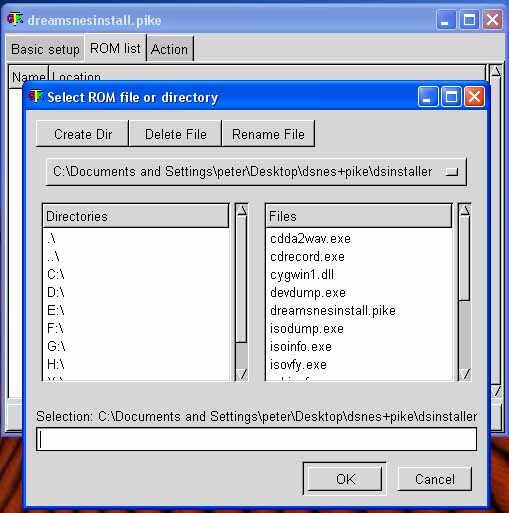 Close the "pike" folder and open the "dsinstaller" folder instead. Start the installer by double-clicking the on "dreamsnesinstall". The installer will first contact it's update server over the Internet to check if it needs updating or if there are any new Dreamcast applications available. When the application is finished upgrading and testing your system (should only take a few seconds) it will show you the "Basic setup" tab. Note: If the program is unable to detect any CD-writers then your windows installation lacks contain working ATPI-drivers. You can fix that by downloading the ASPI Layer Fixer from http://www.dcemulation.com/neededtools.htm. Apply the fix, reboot, and then start the DreamSNES installer again. Select the burner you want to use by clicking on it. Select the application you want to burn by clicking on it. In this case "DreamSNES". Optional: If you are low on disk space you can select "Direct burn". That way it will burn directly from the files without first creating a CD image file. This works well on modern PCs with good hardware, but increases the risk for buffer underruns on slow PCs. Click on the "ROM list" tab to change view. Click on "Add" to bring up the ROM file selector. Select the ROM you want to add to the CD and press "OK". Repeat the last step until you have added all ROMs you want burned on the CD. Optional: Instead of adding ROMs file by file you can add an entire directory. Select the directory you want to add in the directory view to the left, BUT DON'T OPEN THE DIRECTORY. Then press "OK". A small requester will ask you if you really want to add all ROMs in that directory. Click on "Yes". 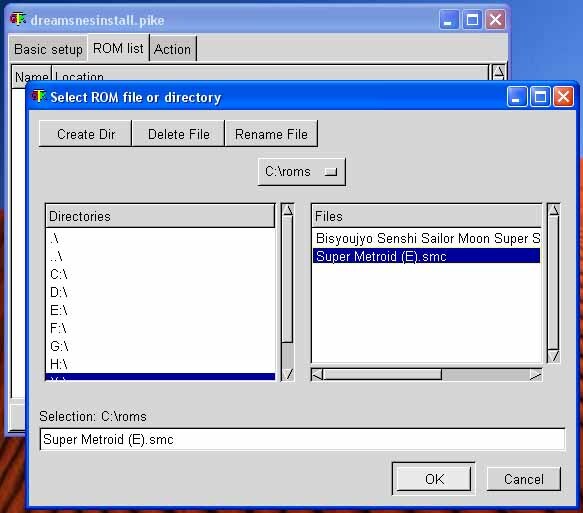 Optional: When you are finished adding the ROMs you want to use you can choose to change the names that will appear in DreamSNES ROM loader screen. Select a ROM you want to change the displayed name for and press "Rename". ... then press "OK" and repeat with other ROMs until you are satisfied. Click on the "Action" tab to go to the final phase of the CD-R creation. Make sure you have a blank CD-R in your burner and then press the big "Start" button. After 100% has been reached it will take some time to empty the buffers and fixate the CD-R, so there will be an extra minute or two of waiting after 100% has been reached. 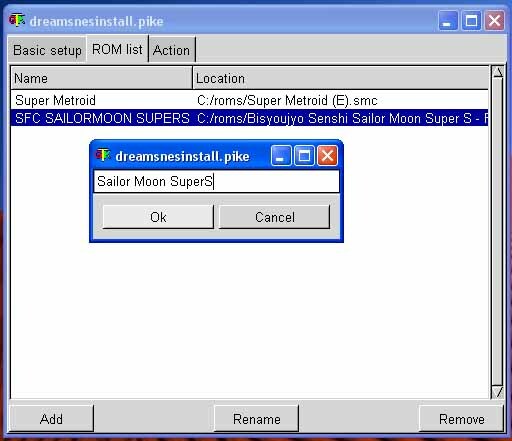 When the Info requester pops up, press "OK" to exit the installer and then put your finished DreamSNES CD in your Dreamcast. Start the Dreamcast and enjoy the fun. Written by Peter Bortas, Copyright 2002. 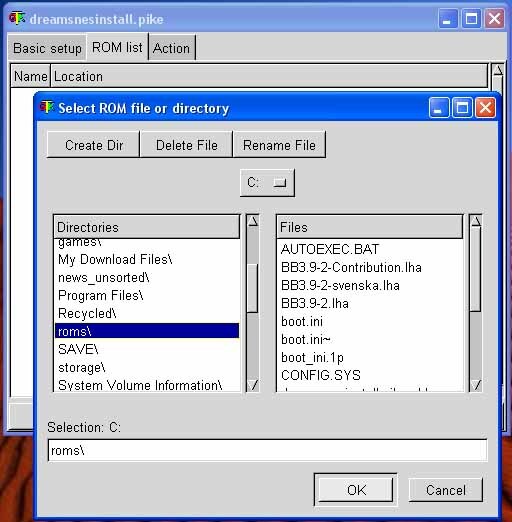 Permission to copy this tutorial and incorporate it into your own site is granted as long the link to the installer (http://www.lysator.liu.se/dreamsnes/dsinstaller.zip) is not modified to point to any other location, and that this copyright and distribution notice appears somewhere on the page. This is for security and support reasons. Other than that, do whatever you wish with it.